SAN DIEGO--(BUSINESS WIRE)--A study of 44 public biotechs in San Diego showed CEO salaries increased an average of 7.6 percent from 2012 to 2014. 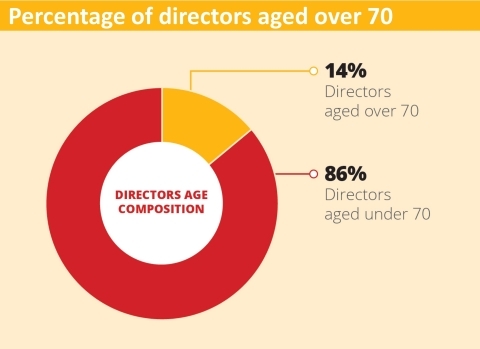 An analysis of the age, experience and gender on the companies’ board of directors suggests a need for diversification. The study, conducted by Liftstream, also analyzed CEO salaries in relationship to market cap, board director fees, and board refreshment. Liftstream provides executive and board level recruitment for life science companies around the world. Data was collected from the proxy statements (Form DEF 14A) issued between 2012 to 2014 for 44 public biotech companies specializing in either therapeutics or diagnostics located in San Diego County. The selected firms were peer-grouped by market cap ranging from $1.62 million to $20.8 billion, covering both early stage to mature corporations. Ninety-one percent of the companies studied had market caps of less than $1 billion. Forty-four CEOs and 322 board directors were included in this research. Average CEO salary increased 7.6 percent from $428,371 in 2012 to $460,749 in 2014. CEO salary in 2014 exhibited a clear relationship with market cap. Equity incentives (stock awards and options) served as the main financial incentive for attracting executives, making up more than 70 percent of CEO total compensation. The median for both non-executive director fees and board chair retainers was $35,000 in 2014. The majority of boards split the CEO and chair role, which is a positive indication of independence and reflects the governance trend across broader markets. Thirty-one percent of the board director population studied has served more than nine years, prompting questions of independence despite no official term limits. Ten percent of the board membership turned over between 2014 and 2015. The average age of San Diego biotech board directors in the study was 60 years old, and 14 percent (45 of 322) were over 70 years old. Among the 44 companies studied, only one woman CEO and two female board chairs were identified. Nine percent (29 of 322) of board directors were women. Women were most seen serving the audit committee of the board. Education, age and tenures were relatively equal between the genders. More information about the study entitled, can be found here: http://www.liftstream.com/board-and-ceo-whitepaper.html. Liftstream is an executive search recruitment practice focused exclusively on the global life sciences sector. Our clients benefit from the advanced sector knowledge we possess and the exceptional people we’re able to recruit for them into positions of leadership. Since 2003, Liftstream has been recruiting outstanding people to the unique and complex challenges of life sciences and who have contributed to innovative new treatments improving global health. Our client partnerships always focus on strengthening our clients’ teams. We achieve this through comprehensive searches and rigorous candidate assessments to identify and appoint the person most suited to our clients. Liftstream is committed to equal opportunities, diversity and inclusion. For more information about Liftstream, please visit www.liftstream.com.